Summer is my favorite season for so many reasons. One is that I have so much more time for reading. The Audiobook SYNC program helps with that: every week they offer two free YA audiobooks for download. I love audiobooks, but they are pretty expensive for just me. 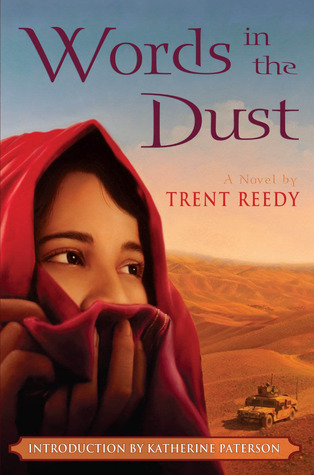 So I take full advantage of the program, which is how I was introduced to Words in the Dust by Trent Reedy. I was a bit hesitant to read a book about Afghan girl written by an American soldier, but Reedy explains himself well in his Author's Note. He says, "Of course, another problem I had in keeping my promise is that I have never been a girl and I am not an Afghan. Many would say that stories about Afghan girls should best be told by Afghan girls. I agree completely. I would love nothing more than to read the story of the girl who we helped in her own words. However, the terrible reality is that by some estimates, 87 percent of Afghan women are illiterate." Knowing who the author is made me pay particular attention to how Americans are portrayed in the book. Yes, there are the savior bits where they give away gifts and selflessly help Zulaikha with her cleft lip. But the Americans also make huge mistakes by not learning enough about the culture, such as offering pork to Muslims. I enjoyed getting the background information on what life is like in a typical Afghan household, although I don't know if young readers will feel the same. I was rooting for Zulaikha to succeed despite all the odds stacked against her. And then, the book ended. I'm pretty sure that I just didn't download the final section of the audiobook, but if I didn't, it is the most abrupt ending ever. Some day, I'll have to check this out in a book store and see how it really ended.